Fraser Highway is congested during peak travel periods. As an example, TransLink schedules the 503 Aldergrove Express to take about 30 minutes to get from Surrey Central SkyTrain to Downtown Langley during off-peak travel times, and 40 minutes during the afternoon peak travel period. As I take the 502/503 every weekday, I know that congestion can make the trip even longer some days. The variability of travel time doesn’t serve transit riders well. Fraser Highway is a major transit corridor, but unfortunately without any transit priority measures. Transit service speeds and reliability will decrease as the corridor becomes more congested. TransLink commissioned a study created in 2012. It found that if transit investment continued at its current level, transit travel times would increase to 51 minutes between Surrey Central and Downtown Langley in 2021, jumping to 54 minutes in 2041. Light rail would take about 30 minutes, and SkyTrain 22 minutes in 2041. That same report found that if smaller-scale changes were made to the transit network, the trip between Surrey Central and Downtown Langley would remain at about 40 minutes until 2041. The greatest amount of congestion happens between Whalley Boulevard and 148th Street today. This section of Fraser Highway is one-lane per direction. 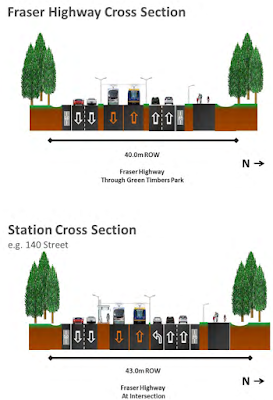 The City of Surrey is proposing the following cross-section for that highly-congested part of the corridor. 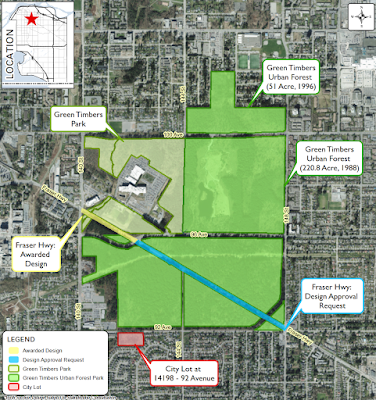 Proposed scope of Fraser Highway widening through Green Timbers in Surrey. Select map to enlarge. Proposed cross-section of Fraser Highway through Green Timbers in Surrey. Select images to enlarge. Rapid transit along Fraser Highway is a long way off, if the proposed “light rail” lanes were used for bus service, it would greatly improve transit service speed. In fact, even adding one reversible transit lane along that section of corridor would do wonders for transit speed. While the federal, provincial, and local governments hash out how to pay for rapid transit along Fraser highway, it is important that improvements be made to transit today to maintain current transit service levels. Making changes to Fraser Highway which improve transit today is possible, and can be funded within existing municipal and TransLink capital budgets. Rapid transit is needed along Fraser Highway, but we can’t wait another 10-15 years. We need to make improvements along Fraser Highway to keep transit running smoothly now.